Short Info: Staff Selection Commission has released an official notification regarding SSC recruitment 2018. There are total 1136 vacancies for Jr. Engineer, Jr. Physiotherapist, Scientific Assistant, Jr. Seed Analyst, Botanical Assistant, Data Processing Assistant, Sub-Editor, and other posts in this recruitment notification. Candidates who want to go to the Staff Selection Commision department can apply for the recruitment. Candidates need to check their eligibility before making the application. They can check it from given official notification. The official notification link is available below in the table. There is a huge rush want to be a part of this department. If you are also one of them and looking for jobs in the govt department, then you are on the right web page. You should have knowledge regarding your eligibility, important dates etc. We have provided all the required information details regarding this recruitment in this article. You should check this whole article to know more concerning it. Documents Verification After qualifying the written examination, candidates need to take part in the Documents Verification process. SSC Selection recruitment 2018 applications have started on 5th September 2018. Aspirants need to know about their eligibility that they are eligible to apply or not. They should remember that they can apply only in one condition if they are eligible in all respects. So, they have to check the official notification with respect to eligibility criteria. Candidates should be aware at the time of making applications. The authority will accept only those applications which will be correctly filled in all respects. Interested candidates need to apply before the last date i.e, 30th September 2018. Because after the last date, the center will not accept any application form. Candidates need to follow some instructions to apply for SSC Selection recruitment like – first of all, go to the official website at ssc.nic.in. Read the official notification fully to be sure about your eligibility. After being sure that you are eligible, if you have a registered id then login it or make online registration if you are a new user. Now, fill the application form by providing all required individual and educative information details. Upload your scanned signature and scanned photographs. Pay the application fee via asked mode. Read the application form carefully before submission. After submission, take a hard copy for further use. The SSC Selection exam will be conducted by Staff Selection Commission. The candidates who have applied or going to apply for the SSC Selection recruitment, they need to know about the syllabus and exam pattern. The questions will come from 10th, 12th, and graduation syllabus. Topics will be General Intelligence, General Awareness, English Language, and Quantitative Aptitude etc. The syllabus helps the candidates to crack the merit list and secure good marks in the examination. Candidates can check the SSC syllabus from this page. The syllabus in details is given below on this page. Candidates who have applied or going to apply for the same, they have to appear in the written examination. And, after that, they need to go for documents verification. To qualify the written examination, candidates should have knowledge of the syllabus and the latest exam pattern. 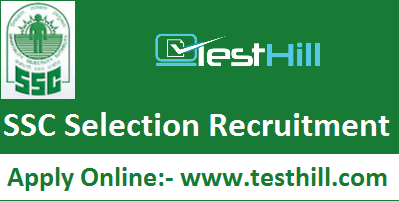 We are providing here the latest exam pattern for SSC Selection recruitment examination. The exam pattern tells the applicants about the total number of questions, total marks, marking scheme, exam time duration, and type of questions. And if candidates don’t have knowledge about it, they can’t able to attempt all questions. There will be 100 questions from 4 sections. And, each right answer will carry one mark. It means total marks will also be 100. There is a negative marking provision also. Each wrong answer will deduct by 0.50 marks.